You might not realize, especially if you’re from the US where it doesn’t get a lot of press, but it’s World Water Week next week (8/24-8/28). It tends to get lost in the back-to-school frenzy (and many schools haven’t even started yet), but it’s a worthwhile cause, and a good learning opportunity for your students in science, literacy, and art. What is World Water Week? It’s a time to come together as an international community and address our global water challenges. There’s a yearly summit in Sweden, with speeches, statistics, and solutions provided by the world’s cutting-edge scientists and companies in the world of water management. It even comes complete with a Junior Competition. When I was growing up, problems with water supply seemed to be very far away – they were problems in Ethiopia or India, not problems that had anything to do with me. I’m not proud of this complacency, but today’s students won’t even have the luxury of complacency. With California experiencing its most severe draught in a millennium, new technologies impacting our groundwater in ways that haven’t been tested long-term, and more frequent and more severe flooding in many parts of the US, questions of adequate water supply and quality are hitting much closer to home than they have in the past. Addressing real, pressing challenges like global water supply is one of my deep wishes for curriculum reform in the US. We prepare students to read, write, and follow directions so they can get a job, but it’s even more important to let them grapple early and often with the human-survival problems they will inherit with adulthood. It’s also an area of curriculum where you can truly encourage creative thinking and problem solving. Our students are going to have to deal with this. It’s irresponsible of us as educators to deprive them of the opportunity to practice. Most of my experience is in early elementary, so that’s where my own ideas are geared. If you teach upper elementary, middle school, or high school, check the bottom under “Other Resources” for a list of better places to go for ideas. With the little ones, approaching water awareness is still about fundamentals – states of matter, kinds of water sources, why water is important, how it interacts with the rest of the environment. 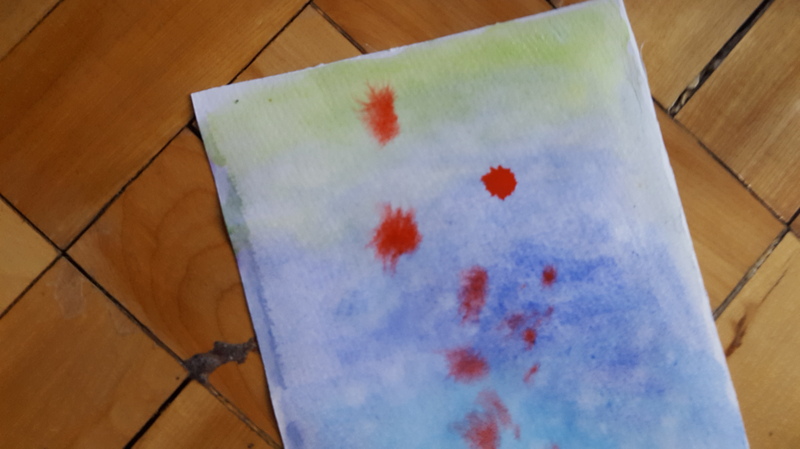 Artistically, what better medium to learn about water than watercolors? Talk about solids – the paper and the brush. Alone, do they affect one another? Not unless you’re really violent. They can touch each other, but they don’t change each other. They just bump. But liquids like water are different. 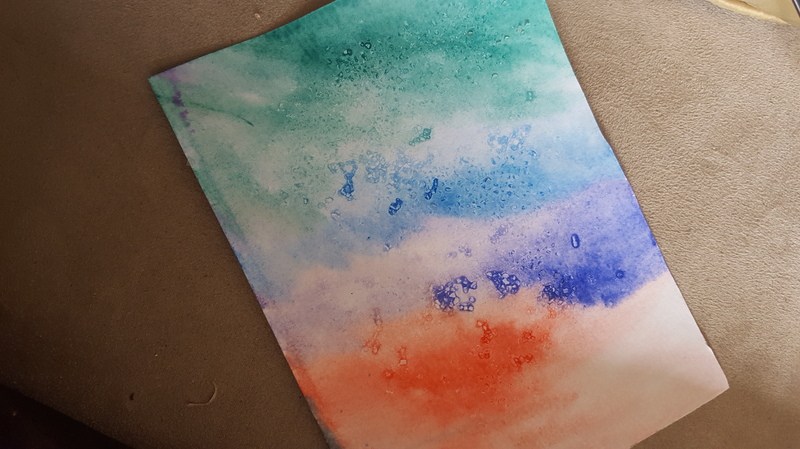 Soak the paper in water and let students experiment with adding different colors and seeing how they run together and blend. 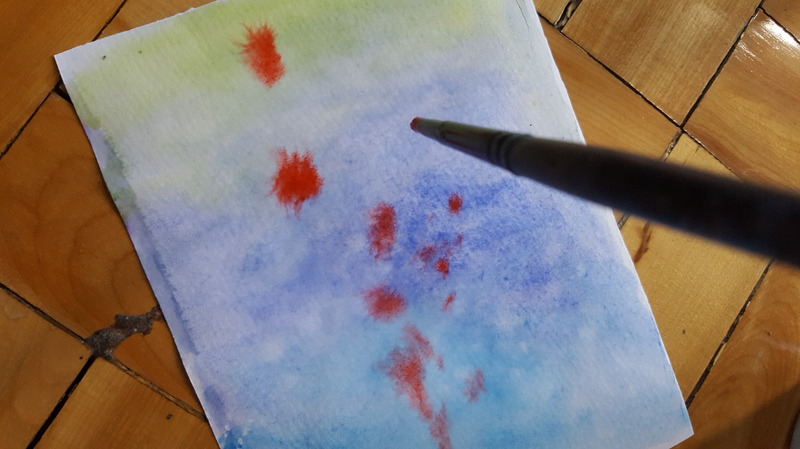 Even without the help of a brush, if there’s enough water on the page, a single drop will still move and spread on its own. 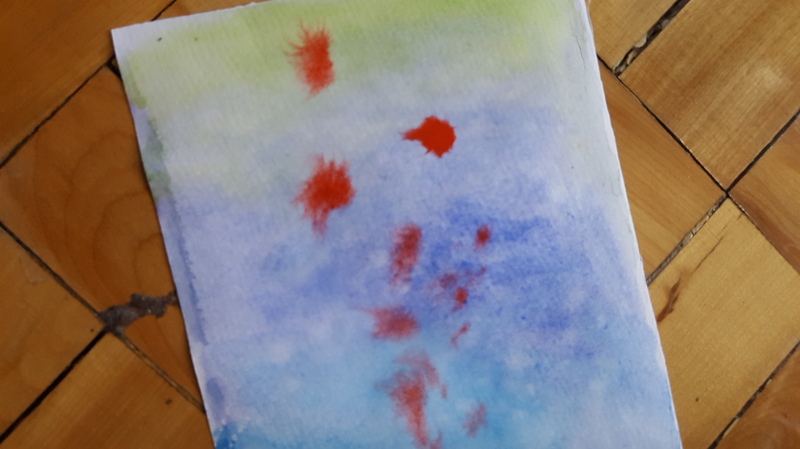 In the picture above, I’m about to add another drop of red. 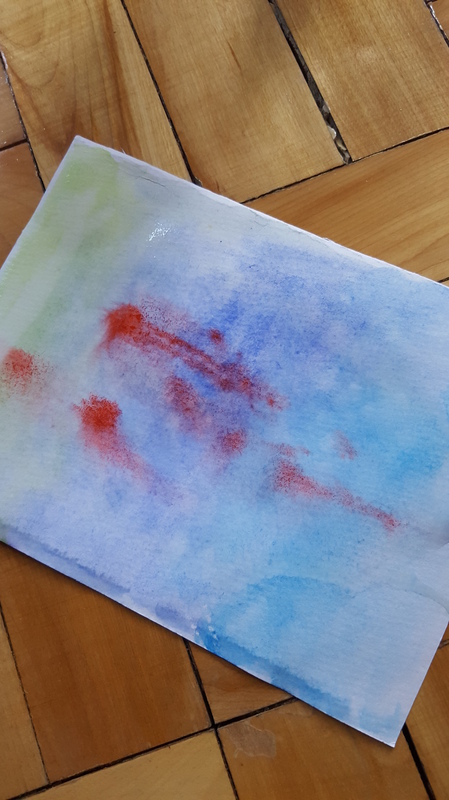 Ask – how did salt and oil change the way the paint interacted with the paper? When you add things to water, do you always know how it’s going to interact? 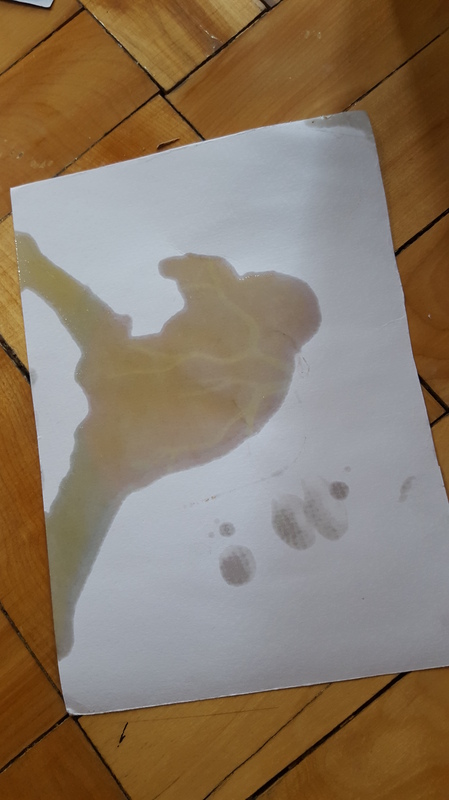 And make sure you have kids look at their rinse water before the lesson is done. What did their “pollution” do to the rinse water in their cup? Would they want to drink it? 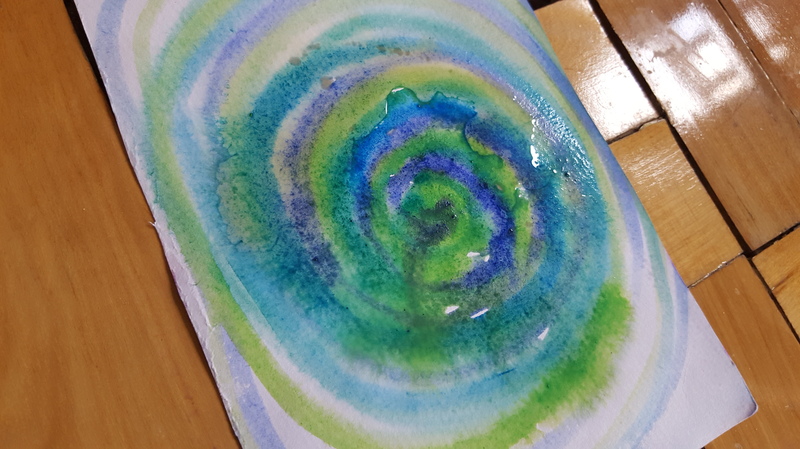 A Simpler Version: If a full watercolor lesson is way too much in the first weeks of the year, another way to illustrate the way water resources are all interconnected is to put a sponge into a small dish of water, and add a couple drops of food coloring to the water (NOT the sponge), and then wait. 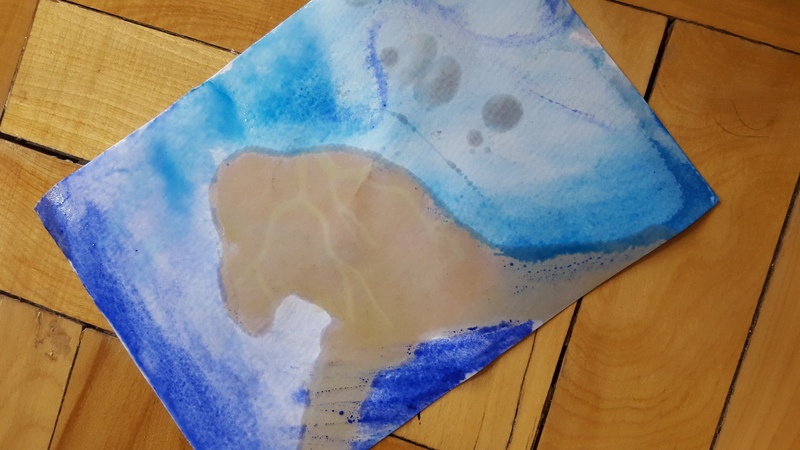 After a couple of hours, without any intervention, the sponge will have soaked up the “pollution.” You can make an analogy between the sponge and groundwater. 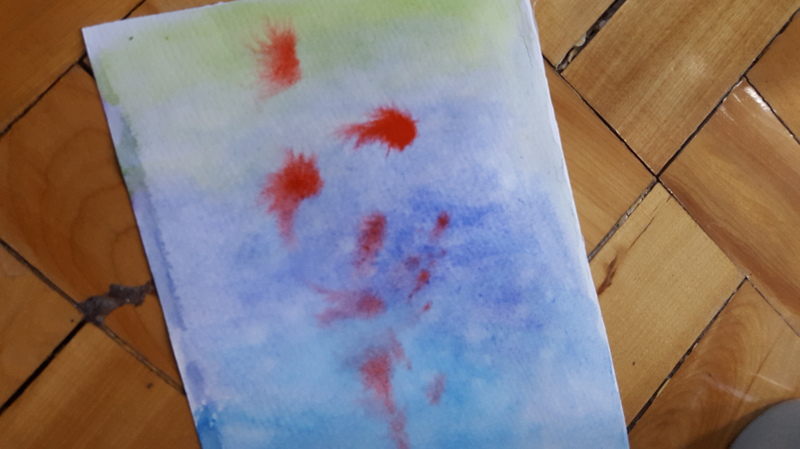 After demonstrating the way water contaminants move freely, have students do some imaginative journaling in which they pretend to live in a town that gets all its water from one pond. What happens if someone dumps something bad into it? You can talk about real-life times when this happened. From my own hometown region, the legendary year that Lake Erie caught fire is a nice example, though it wasn’t even particularly rare at the time. Or, if you want to get colorful, take a cue from George Carlin and ask your students to write about whether they would support the addition of a “Peeing Section” in the local swimming pool. Why or why not? If you want to extend the lesson, have students brainstorm ways to clean up their pond. These can be fanciful – you could even have them create a water-saving super-hero. Or you can talk about how we clean water in most of the US. There is a nice interactive map of a water treatment plant here. Make sure you ask students afterward what they think would happen if the water treatment plant broke down. If I had another week, I’m sure I could come up with some cool stuff for MS and HS, but I ran out of time. Here are some resources I really liked for the older kids. 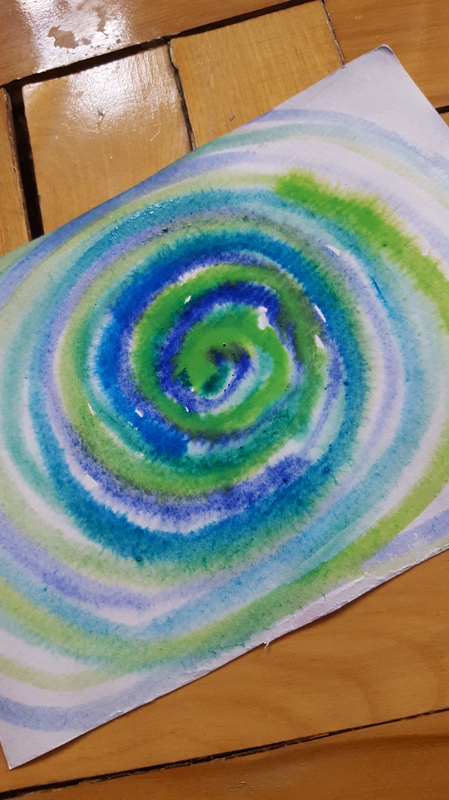 The Water Project has a full complement of water-related lesson plans which are really excellent and also incorporate some artistic modalities, like role-playing. Their Water, Water Anywhere lesson is an especially great game to play. Years of Living Dangerously (the show) has a really thorough and fantastic set of lessons, scaled specifically for MS and HS. That’s it from me. Have you discussed World Water Week with your class? I’d love to hear what you did and how it went!